I thought I'd try taking French in college, but after one week I decided it was too difficult for me. The pronunciations of everything really tripped me up. I've never been great at learning languages despite my desire to learn them. This polish from Girly Bits latest Sweet Nothings Collections is thankfully one of the few I can pronounce. It's pretty too which is always a plus! Tarte au Sucre is a lilac purple sparkling microglitter accented with silver holo, red shimmer and multi coloured iridescent glitter. Color: I'm a sucker for lilac or lavender anything. I love this glittery interpretation. This shade has the perfect softness without being too light or pale. The mciroglitter, red shimmer, and iridescent glitter are perfect compliments to this shade that give it some depth and orginality. Formula: This had an excellent and easy to use formula. I used 2 coats above. This polish definitely needs a top coat as it does dry gritty and flat. Price: This is $12.80 on Girly Bits site. Overall: This is an all around great glitter polish. 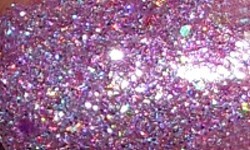 I love the softness of the shade and the added dimension from all of it's glittery counterparts. The formula was great as well as the application. I'd say this is a winning polish.